12-16 piece dragonfly dinnerware set includes 4 of each wheel thrown stoneware approximately 10.5" dinner plates with dragonfly, 7.5" salad/dessert plates, 7" x 2.5" bowls, 12-14 oz mug with dragonfly (optional). 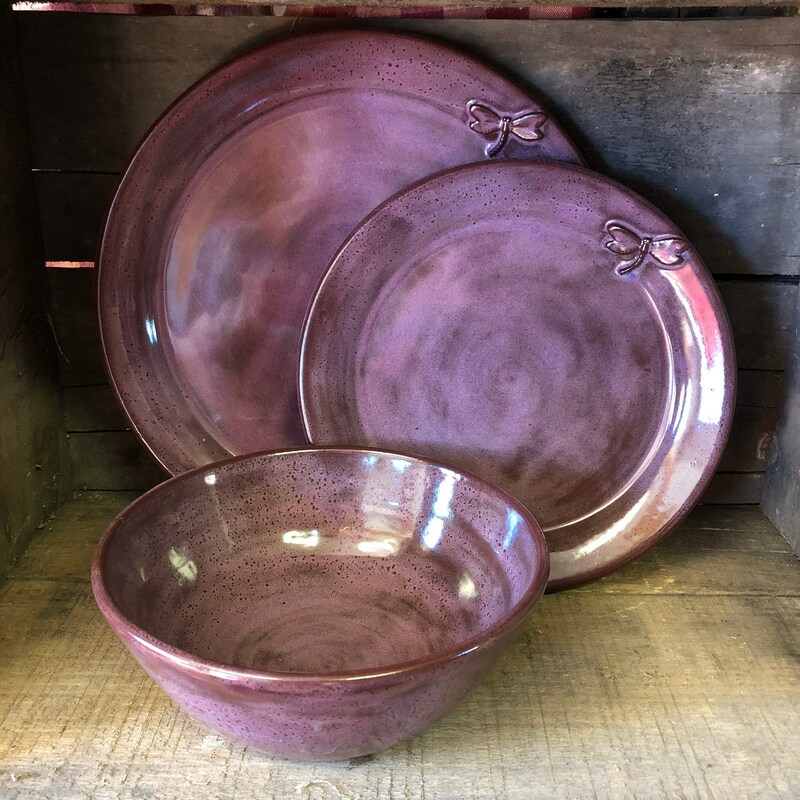 Glazed in Smokey Purple over dark clay, this dinnerware set will be a pleasure to use for years to come! All pieces are wheel thrown, trimmed, signed, glazed, and fired to cone 6 by me! The dark clay below breaks through the glazing to create tones of purple and browns. Each piece will be unique. Food safe, microwave safe, dishwasher safe! Lead free glaze! Pottery dinnerware is MADE TO ORDER just for you! Please note the current production time during checkout. I throw each item individually. Pieces will be similar in size and shape, but natural variations will occur in both shape and glazing. That's what makes handmade so great!! Shipping charges are estimated. Any Shipping overage will be refunded.